Amsterdam, The Netherlands – Royal Philips (NYSE:PHG, AEX: PHIA) today announced that it is the world’s largest patent applicant for patents filed at the European Patent Office (EPO) in 2015. 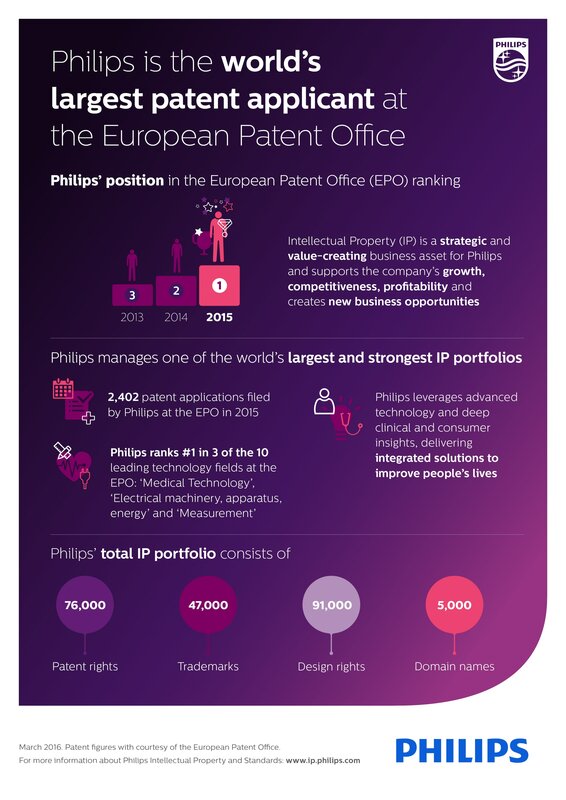 Last year Philips filed 2,402 patent applications according to the 2015 Patent Applicant Ranking, which was released today by the EPO. Philips was by far the largest patent filer from the Netherlands – responsible for one third of all patent applications by Dutch companies – and therefore strongly contributing to the rise of the Netherlands as second largest country in the world in terms of patent applications at the EPO per million inhabitants. 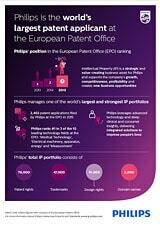 Philips’ current IP Portfolio consists of 76,000 patents, 47,000 trademarks, 91,000 design rights and 5,000 domain names. Philips leverages advanced technology and deep clinical and consumer insights, delivering integrated solutions and innovations to improve people’s lives and enable better outcomes across the health continuum, from healthy living and prevention, to diagnosis, treatment and home care. “With our strong IP portfolio we protect these solutions and innovations which support the company’s growth, competitiveness, profitability and create new business opportunities,” Hinman adds. “Philips has consistently been among the most active applicants at the EPO for many years and for the company to have been the EPO’s top applicant in 2015 is a great achievement. The prominence of Philips and other European companies in our top ten attests to the dynamism of European inventors and innovators,” said Benoît Battistelli, President of the European Patent Office. The full press release and supporting materials made by the European Patent Office can be found on www.epo.org. More information about Philips Intellectual Property & Standards can be found on www.ip.philips.com.